Preheat your oven to 140C. Meanwhile, make your dry rub: in a mortar and pestle, grind up the salt, sugar, Sichuan peppercorns and cumin seeds. Once they reach the consistency of a coarse powder, crush in the garlic and add the rice wine vinegar, making sure everything is fully combined. With the tip of a sharp knife, make shallow scores into the skin and fat of your lamb shoulder, cross hatching the entire surface. Then massage the dry rub into all sides of the meat, using your hands to ensure the mixture gets deep into where you have scored. Next, chop your onions and peppers into large chunks and sprinkle them over the base of a large roasting tin or baking tray. Place the seasoned lamb shoulder over the top of the bed of vegetables, ensuring that all of the vegetables are hidden underneath the meat, and then wrap the tray tightly in tin foil. Place the wrapped dish into the centre of your preheated oven, and leave to roast for 4 hours. At this point, remove the tin foil from the dish and increase the temperature to 160C. Return the lamb to the oven for a further 45 minutes, allowing the skin to crisp up. 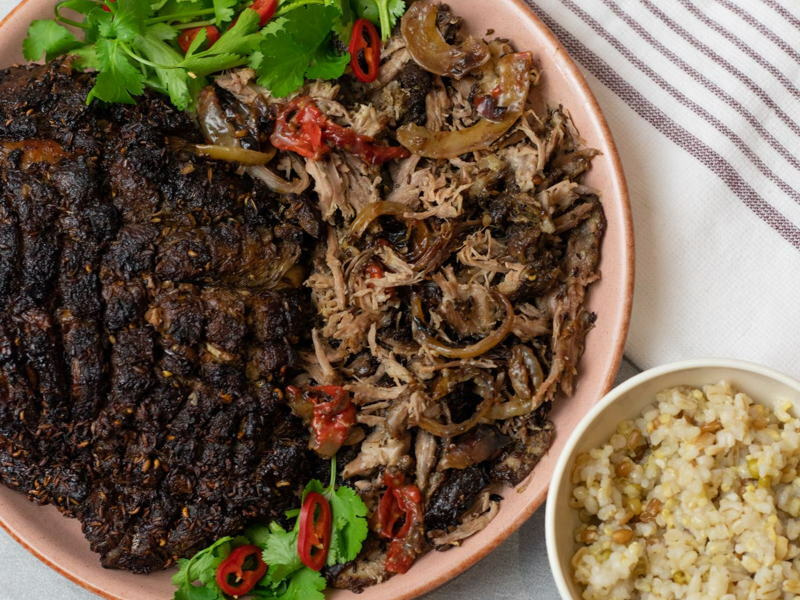 Once your lamb is well-roasted and falling off the bone, remove it from the oven and serve with a garnish of coriander and fresh chilli, and side of rice. Enjoy!